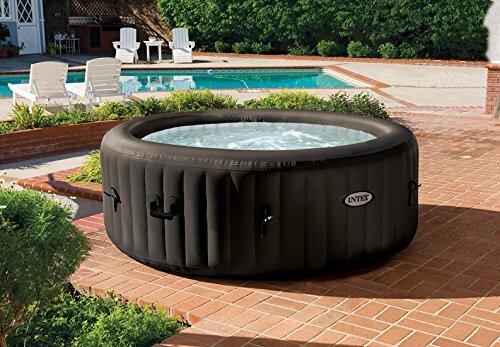 Includes: PureSpa Hot Tub, Insulated Cover, 3 Way Water Test Strip, Ground Cloth, Filtration System w/ 2 Filters, Chlorine Dispenser, and so much more! Relax and indulge yourself in the Intex PureSpa Portable Hot Tub. With the touch of a button activate the 4 high-powered performance jets that surround the interior of the spa or adjust the temperature that best suits your comfort level. This Intex PureSpa Portable Hot Tub provides simple maintenance with two easy-to-replace filter cartridges for clean refreshing spa water, and the built-in hard water treatment system makes water gentler on skin for a soothing experience. Made with durable Fiber-TechTM Construction including 48 Fiber-TechTM beams, the PureSpa is also strong enough to take a seat on the side when all you need is a dip of your feet.